Jamyang - exc.1, CAC, CACIB, BOB, Cublay-Khan Djomo Gangkar (Djingi's son) - exc.1, CAJC. Sincerely congratulations to Bara and Dagmar !!! 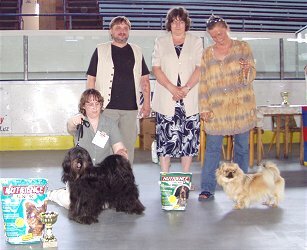 World Dog Shoe Poznan 2006 - entered 62 Tibetan Terriers, all results are here. 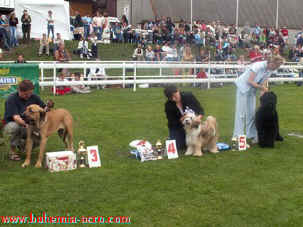 Our results: Jacko - exc.2 (junior class), Aran and Jamyang - excellent (class champion and open). 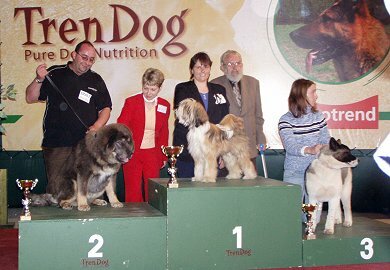 Aránek - exc.1, CAC, CC, Club Winner SKCHTaF 2007, Jacko - exc.1, CAC, CC, Noisy - exc.3. Jamyang - exc1, CAC, CACIB, BOB, the closer final BIG IX. A lot of thanks to all judges and sincerely congratulations to all !!! Djingi (11 years! ), Jomi, H'Aran, Noisy, Kubik and Fimbu - all were eyechecked with result negative. Jomi - exc.1, CAC, Special Show Winner, Vítěz speciální výstavy, res.BIS female (from all breeds in show) !! Noisy - exc.1, CAJC, and the closer final of BIS junior female, Jamyang Tashi Bodjul - exc.1, CAC. Cublay-Khan Djomo Gangkar (our Djingi's son) - exc.1, CAJC - he has finished his Czech Junior Champion title !! and granddaughter of H'Aran) and Alyssa of Darkness (daughter of Jamyang). Thank all judges very much and sincerely congratulations to all !!! 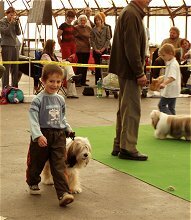 My little nephew Kamil was with Noisy in the "child and dog" competition (for child 4 - 13 years). Jomi - exc.1, CAC, CACIB, BOB. Noisy - exc.1, CAJC and 3. place Best Junior Female in Show. H'Aran - exc.1, CAC, CACIB, Jacko - exc.1, CAC, Jamyang Tashi Bodjul - exc.1, CAC, res.CACIB. Cublay-Khan Djomo Gangkar (son of our Djingi) - exc.1, CAJC, finished Czech Junior Champion! 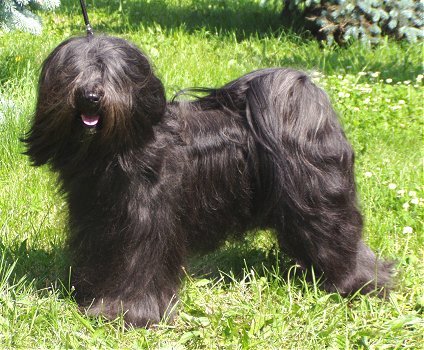 Jamyang Tashi Bodjul - exc.1, CWC, CACIB, Best Male, BOB - he has finished his Polish Champion title. - she gains her International Champion title. We are lucky of them, sincerely congratulations to Bara and Agnieszka! Jamyang - exc.1, CAC, CACIB, BOB, and res.BIG by Mr. Zoran Curcic, SCG. Noisy - exc.1, CAJC, 4. place Best Junior Female in Show. Pirjo, a lot of thanks for this wonderful girl !!! Jana, Bara and Magda, well done !! Jamyang Tashi Bodjul - exc.1, CAC, CACIB, BOB, Jacko - exc.1, CAJC, Noisy - V2 (junior class). Noisy - exc.V1, CAJC, Jacko - exc.1, CAJC. Great congratulations to Jana, Magda and Bara !!! 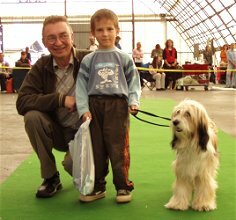 Jomi - exc.1, CAC, National Winner, BOB, and also BIG 5 by Mr. Denis Kuzelj, charmain of Slovenian Kennel Club. Noisy - exc.1, CAJC, Jacko - exc.1, CAJC, Jamyang Tashi Bodjul - exc.1, CAC, National Winner. 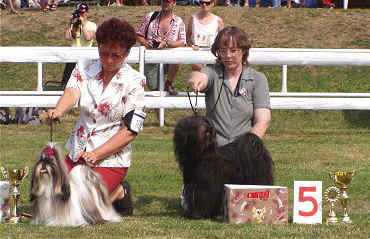 Jacko - exc.1, CAJC, Club Junior Winner 2006, Best Junior Dog in Show. Pat, thank you very much for this lovely and beautiful boy! Himal Senge Tashi Bodjul - exc.3, Hor-Khang Tashi Bodjul - exc.3. Pirjo, many thank for this young pretty girl! 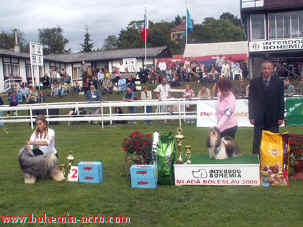 Best Tibetan Terrier Sobeslav 2006, Best Female in Show, and Best in Show !!! Thank the judges very much for their judgement of our dogs! Jomi - exc.1, CAC, CACIB, Noisy - very promising 1, Jamyang Tashi Bodjul - V2, res.CAC. New pictures of our Jomi. 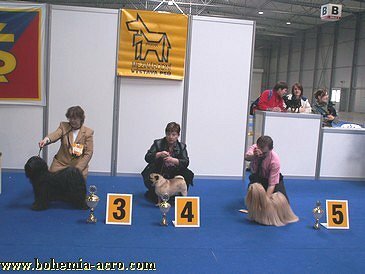 FCI European Dog Show Helsinki 2006 - results. Congratulations to all winners! 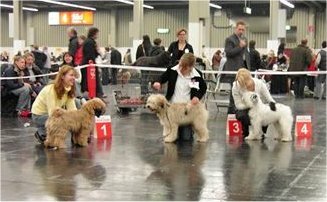 FCI European Dog Show Zagreb 2007 - information and entry forms. Jomi - exc.1, CAC, CACIB, BOB, and again the closer final of BIG IX. by slovenian judge Mrs. Tatjana Urek. Noisy - very promising 1 (in competition from four), and afterwards she won BIS Puppy !!! Evry (Pam-Zamirin Everest Pan-Jo) - exc.1, CAC - he gains Slovak Champion. Jacko - exc.1, CAJC, Jamyang Tashi Bodjul - exc.1, CAC, CACIB, BOB. Sincerely congratulations to Bara and Magda! Jomi - exc.1, CAC, CACIB, BOB, and also BIG 3 from the great competition !!! We were also pleased by results of our youngests: Jacko - exc.1, CAJC and Noisy - very promising 1. Big congratulations to Magda and Jana! Hinayana Tashi Bodjul - exc.1, CWC, and her daughter Amrita Divalí - exc.1, CWC. Jamyang Tashi Bodjul - exc.1, CAC, CACIB, BOB, BIG 5, and finished International Championship FCI. Djingi's son Cublay-Khan Djomo Gangkar - exc.1, CAJC by his debut in the junior class. Bara and Dagmar, sincerely congratulations !!! Jomi - exc.1, CAC, National Winner, Jacko - exc.1, CAJC, Noisy - very promising. the both dogs have presented very well, a lot of thanks, Pat and Pirjo, for these lovely dogs !!! "Top TT of the Year 2005 - male" is her litter-brother Jamyang Tashi Bodjul (492 points). Bara, Jana and Mr. Kubes, well done, great congratulations !!! were eye-tested, all with result negative. our Villi - exc.1, Best Veteran. Sincerely congratulation to our Djingi's nice son! Djingi - Czech Veteran Champion, Veteran BIS 3.